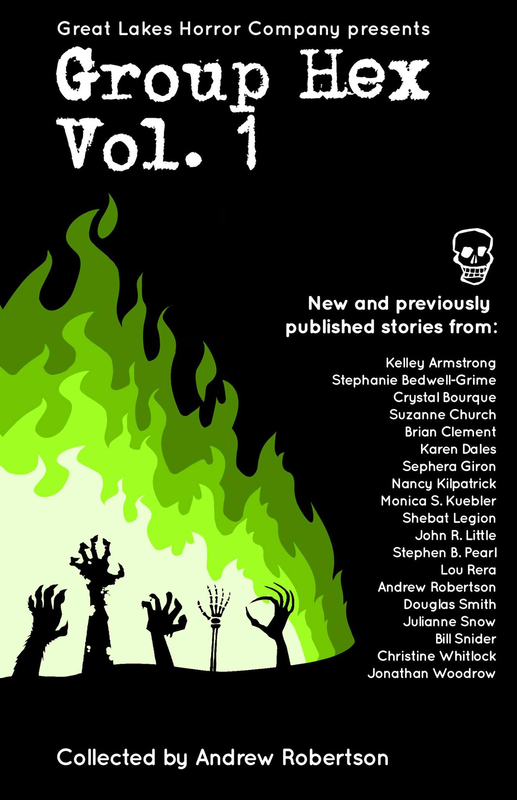 I have a story in a new anthology just released by the HWA (Horror Writers Association). The antho is called Group Hex and features an impressive line up of stories from the Ontario chapter of the HWA. So yeah, an all-Canadian, all-local horror anthology. This is volume one, as our chapter is planning to make this an annual publication. My story is "By Her Hand, She Draws You Down," which first appeared in the excellent UK dark fantasy magazine, The Third Alternative (now Black Static) in 2001. It was an Aurora Award finalist and was selected for Best New Horror #13 the following year. And yes, this is the story on which the award-winning short film of the same name was based. I'm thrilled to be included with such a great collection of authors, who include Kelley Armstrong, Nancy Kilpatrick, John R. Little, Julianne Snow, Suzanne Church, Stephanie Bedwell-Grime, and many more. The Great Lakes Horror Company presents this collection of 19 new and previously published horror stories from some of the best writers lurking on the chilling shores of the wild and wicked north. Cannibals, zombies, vampires, vengeful gods, psychotics and the supernatural are just a few of the terrifying things waiting for you in this collection featuring members of the Horror Writer’s Association Ontario Chapter. Gathered here are award-winning best-selling authors, bold and bloody newcomers, and more than a few unhinged souls telling tales that will make your blood run cold. Illustrated by celebrated genre artists, Group Hex Vol. 1 transports you to the hungry shores of future worlds, to the heart of mystical planes, and to the rooms of what seem like perfectly normal suburban houses…but they aren’t. And after reading these tales, you may never be the same again. The antho is available at most ebook retailers, including Amazon.